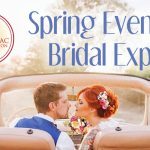 KANDU Industries Inc.Spring Evening Bridal Expo - KANDU Industries Inc.
On Thursday, March 7th, Best Events presents the Spring Bridal Expo at the Pontiac Convention Center. Brides, grooms and their loved ones are invited to visit with a wide array of local wedding vendors, providing the opportunity to plan the perfect event… All in one place! Guests can sample complimentary wine, beer and appetizers, as well as view the latest fashions and styles for the upcoming wedding season. Cash and prize giveaways will be available throughout the event. Doors will be open from 6:00pm to 9:00pm and admission is $7 (cash only). Click here to follow the event on Facebook.